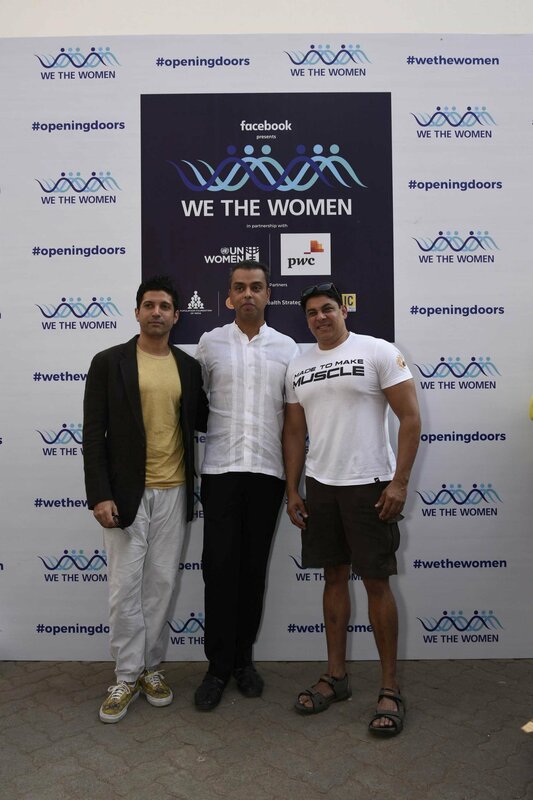 ‘Opening Doors’, quite literally, We The Women broke barriers of gender, race, caste and creed to speak to both men and women about gender neutrality, feminism and celebrating those who made a difference. Panel discussions with the backdrop of colourful doors set a liberating tone to the stories which left the audience inspired and empowered. What left most in awe is not just the line-up of inspiring women and topics, but also an engaging group of men, not only as a part of the audience, but also as participants in panel discussions, talking on topics like #MeToo and Feminism. It was equally liberating to watch some remarkable men step forward and have a dialogue about equality across spheres in a world dominated by the patriarchal social norms. Talking of one of the panels which really moved me, Farhan Akhtar, Milind Deora and Cyrus Broacha must have left most men of the house inspired to become better individuals. They talked about the role men of the society should play in liberalising a world which should ideally be neutral to all, across genders. Farhan Akhtar, who refused to back his cousin Sajid Khan once he faced the wrath of the MeToo movement, rightfully mentioned how we tend to scare the vicious men and the young boys of the society by the consequences of their ill deeds. This was something we saw in the Nirbhaya case and the constant debate and coverage around what happened to the boys accused. “Fear of repercussions shouldn’t be reason for people to behave themselves,” mentioned by Farhan, was a statement that covered all, raising better children and developing a consciousness amongst the men of our age that behaving ourselves should be a reflex action and not an external effort to avoid what may follow. It is, invariably, our thinking that needs to be corrected when it comes to respecting the opposite gender. Everyone should strive to be ‘inherently a certain well-behaved person.’ This, coming from a man himself, was truly a moment of admiration. The three men also mentioned how it’s more of a generation issue and less of gender disparity that affects how the society perceives a woman’s actions. An example would be of simply a date. Where a man from Generation X (Grandfathers) would think a date has to end in a certain way, Generation Y (Parents) would interpret it differently, assuming the next meeting would mean that a woman would want something. Generation Z (Millennials), on the other hand, would find the whole idea ridiculous. Shaping mindsets would highlight the need of raising a generation with a strong conscience. Cyrus, being brutally honest and appreciably frank about how men are differently wired than women, talked about how noticing a good looking woman or a man isn’t an issue but how thoughts should not imply an ill-intention is of crucial importance. ‘Accepting and finding a middle ground’ is a more critical standpoint. ‘She’, a film made by Marth, Farhan Akhtar’s foundation along with Population Foundation of India (PFI), showcased what it’s like to be a woman in a man’s world. Walking down the streets and avoiding the stares and the viscious look of the not-so-good men, is something men wouldn’t be able to live with on an everyday basis. The discussion not only resonated with the women in the house, but a lot of young girls, one of who came forward to share her story, finding the courage to talk to a group which understands. Men sharing perspectives about how the society treats women, skewed towards a more male chauvinistic approach, was an interesting and an empowering moment, strengthening hope. We The Women was not only a platform which initiated conversations but an event that left you with something to take home with you. Every woman walked out with confidence that it’s never too late to make a difference.